Just A Car Geek: 1981 Fiat Panda With 1250 Original Miles! 1981 Fiat Panda With 1250 Original Miles! This car is located in Italy. I am not suggesting anyone buy this car. (Although being over 25 years old you could import it to the US without much of a problem.) I'm just pointing it out for its uniqueness. 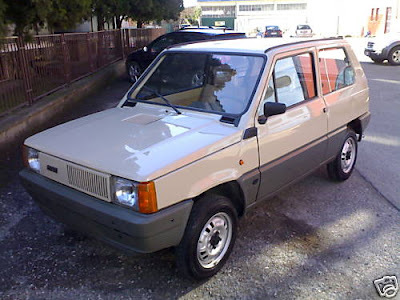 Listed on eBay is a 1981 Fiat Panda with a claimed 1250 original miles. Looking at the photos I would have to say that's true. The Panda was Fiat's entry level car and why anyone would buy one and then not drive it is a mystery to me. Most of the Fiat Pandas came with a 652 cc 2 cylinder engine. This one, being a "Panda 45", has a 900 cc 4 cylinder engine. The pictures are pretty amazing to look at. This is about as basic as basic transportation gets from a major manufacturer. The front seats are paper thin. The dash has just a minimal amount of gages and vents. The shift lever sticks out of the floor, there's not center console of any kind. If there's a place for a radio, I can't see it. There are no rear license plate lights, just blank out plates (maybe they were an option). The seat covers, door trim and dash cover were made to be easily removed for "washing". In a way, this was Fiat's more modern take on a Citroen 2CV. Buying a car sight unseen from another country is always a risky proposition. But, I guess, if you're looking for a new 1981 Fiat Panda, this is as close as you'll ever find in 2009. Click here to see the eBay listing for this Fiat Panda.